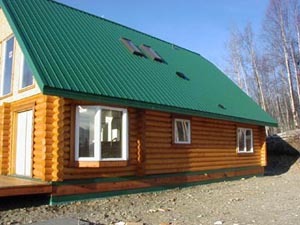 Alaskan Made Superior Logs - Construction Benefits. 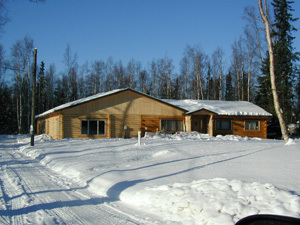 Large Superior Logs addition onto an older 3-sided log home. 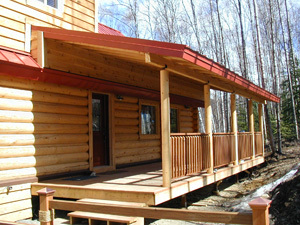 Covered deck with 10″ Superior Logs showing log metal-base-flash. 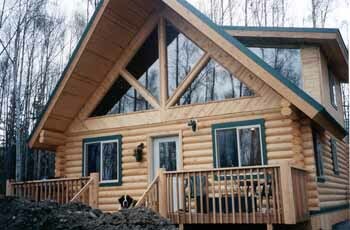 Nice trim & window compliments 10″ logs. 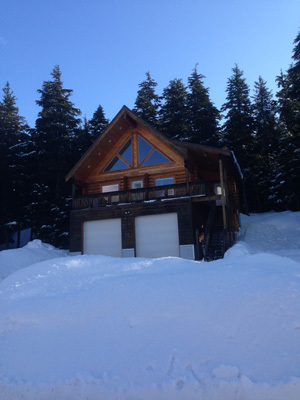 10″ Superior Logs home w/ 2 car garage set in the mountains. 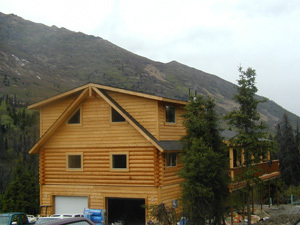 Modified 8″ Superior Log Kenai Prince IV under construction with daylight basement. 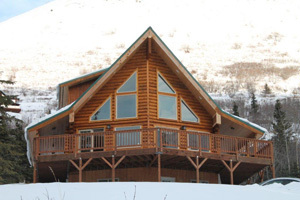 8″ Superior Log home on a daylight basement with log-sided gable ends. 8″ Superior Log 3-story home w/ full logs,log siding and T&G. 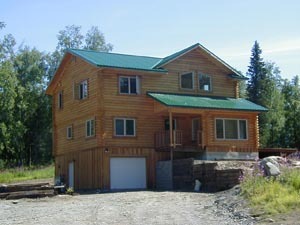 Custom log home with full basement, board N batt, arctic entry, logs & log siding. 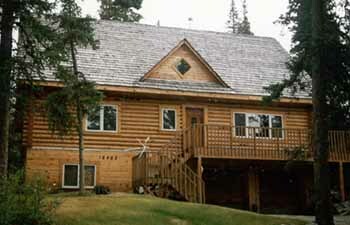 8″ Superior Log home w/ skylights. Nice south facing windows for natural light. 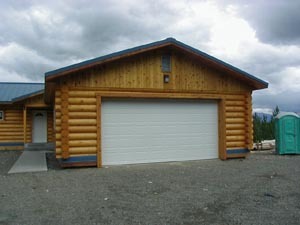 10″ log-sided, saddle cornered oversized garage attached to pre-cut 10″ log home. 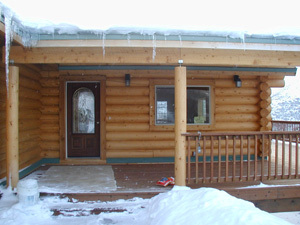 10″ Superior log siding & 10″ full logs continuous wall. 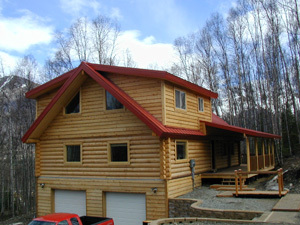 Pre-cut 10″ SuperiorLog home with lapped siding above & covered front desk. Nice covered deck at entry. Log over frame garage with dormered loft. Exterior bay window and nice covered entry.. 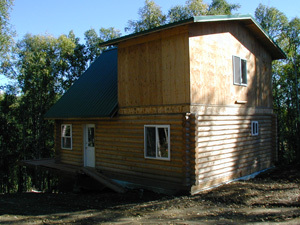 Owner built 8″ pre-cut log home on post ‘N bream foundation . Entry view of beautiful 8″ pre-cut Superior Logs home with oversize 2 car garage in our half log siding with saddle corners. 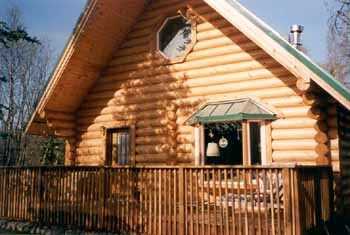 Rear view of 8″ pre-cut log home with log-sided garage. 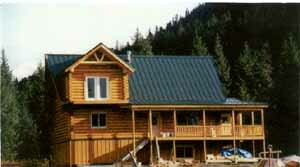 Front view of 8″ log home with 2 side covered decks..
8″ half log sided frame garage with saddle corners. 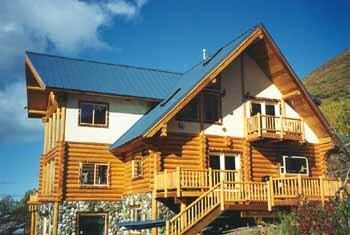 Gorgeous prow front with 8″ half log siding and beautiful windows. 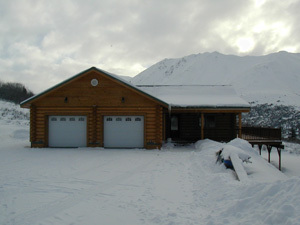 Great Alaskan mountain home with covered side decks. 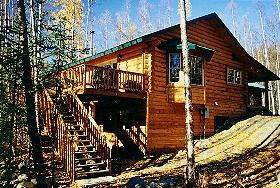 This 8″ log home ade 5 Star Energy. It has a 12′ front deck. 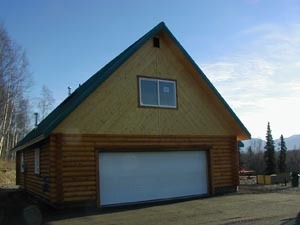 Girdwood log home above daylight 2 car garage with great front window package. The 2,600 sq. 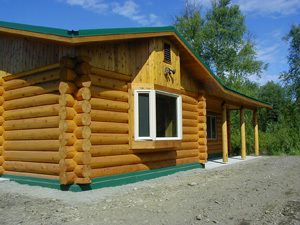 ft. Beluga plan in our 10″ Superior Logs has a 780 sq. ft. attached 3 car garage, covered entry with interior arctic entry & log arch, lap cedar trimmed frame daylight basement, standing rib (no screws showing) steel roof, vaulted great room using scissors trusses & grills on the low E Argon vinyl windows. Note the 10″ Superior Logs half log siding on all the gable ends. The Beluga also features a bay window nook, corner river fireplace, 2 ½ baths, 3 bedrooms PLUS an upper stairs master suite with recessed lighting & a master bath with skylight, atrium, dual showers, jetted tub, his & hers walk-in closets. The back deck overlooks Peters Creek. What a way to enjoy the Alaskan experience!! 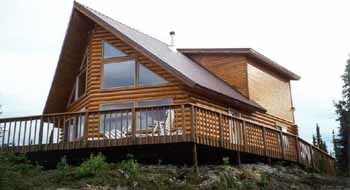 This 2,300 square foot custom Anchorage Hillside log home blends beautifully with it’s surroundings. Our 8″ Alaskan Made Superior Logs were delivered the day the subfloor was finished!!! 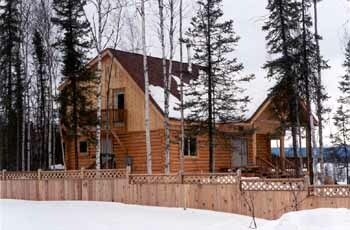 This modified Susitna plan in our 8″ Superior Logs has 1 x 6 T & G knotty pine gable ends, shake roof, skylights, patio & entry doors to the 6′ & 8′ outdoor wood decks, wood casement windows, 2/3 loft & many custom client requested features throughout. This plan is an original, as most all of our homes are!!! The front of the “Kenai Prince IV” is guarded by our owner’s Saint Bernard. The 1X6 T&G knotty pine reversed herring bone pattern is a nice touch on the gable. The prow front trap windows, dormers, 6′ deck log rail posts make this home an extraordinary beauty gracing the Peters Creek country side. 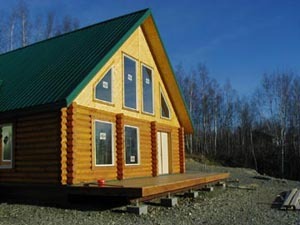 The 24′ x 28′ “Kenai Prince IV” is a 3 bedroom, 1 bath home with a full basement. The dormers make a wonderful master suite with walk-in closets. 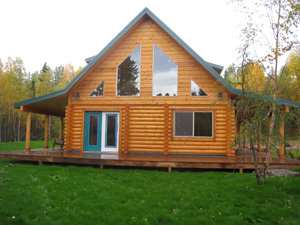 The 26′ X 32′ Susitna plan in our 10″ Superior Logs was modified slightly for this Eagle River owner. The bay & octagon vinyl windows plus the 8′ deck make this a cozy retreat. 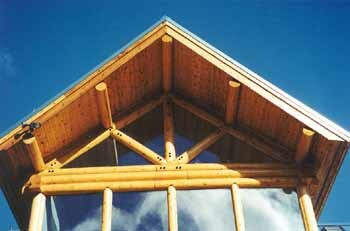 Our 10″ Superior Logs top 3 courses stagger to 4′ carrying the roof overhang with the glue lam beam ridge. 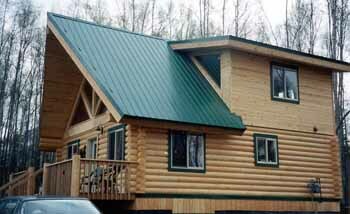 Our 10″ Superior Logs half log siding is on the front gable only with 1 X 6 T & G knotty pine on the back. 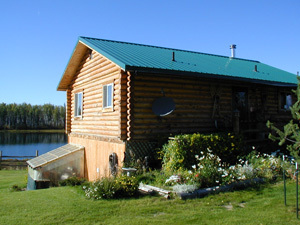 The Susitna 26′ X 32′ weathered-in shell package price is available in 8″ & 10″ Superior Logs. 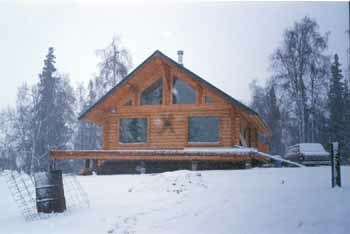 This 24′ X 32′ Chalet plan in our 10″ Superior Logs is over 2,100 sq. ft. with the full daylight basement & 3/4 loft with shed dormer. 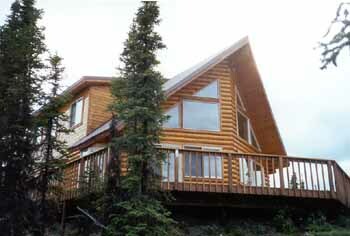 The Eagle River owners sit atop Hyland Road & look down the valley at spectacular mountain views. They recently added an outdoor hot tub on the deck. The 28′ X 32′, 1,554 sq. 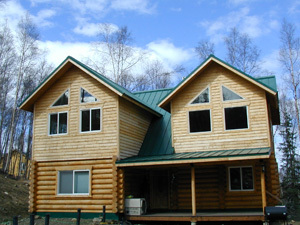 ft. Eklutna plan in our 8″ Superior Logs overlooks the Kenai River with full wrap around 4′ & 12′ decks. 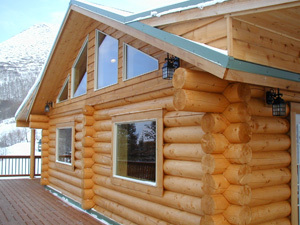 The 6′ frame prow front window wall has our 8″ Superior Logs half log siding on both sides. Our 1 X 6 T & G #2 knotty pine graces the 2 shed dormers with a the master suite with walk-in closet & full bath in the 1/2 loft. We provided the full weathered-in shell package for the owners. 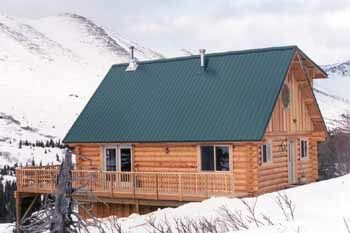 The Eklutna 28′ X 32′ (as shown) & 28′ X 36′ weathered-in shell package prices are available in 8″ & 10″ Superior Logs. 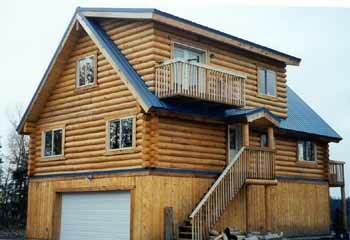 The 26′ X 32′ Sleeping Lady plan in our 10″ Superior Logs was modified to sit over a basement for this Anchorage Hillside owner. Our 10″ Superior Logs stagger to 4′ carrying the roof overhang with the glue lam beam ridge. 1 X 6 T & G #2 knotty pine is above & below the logs. There is a view of Cook Inlet from the 1/2 loft master suite. 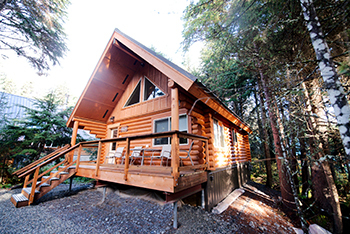 The 26′ X 40′ modified Aleutian in our 10″ Superior Logs sit over an above ground 2 car garage with recreation room & storage. 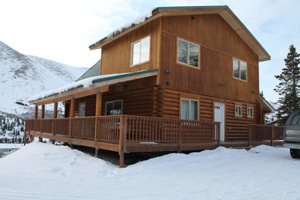 This Mat-Su Valley owner has mountain & Susitna River views from the front deck, great room & 1/2 loft master suite. 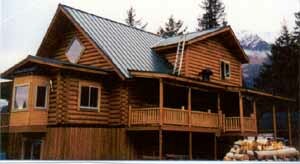 Our 10″ Superior Logs half log siding covers the gable ends & dormer above the pre-cut logs. The steel roof puts the snow on the ground where it belongs. 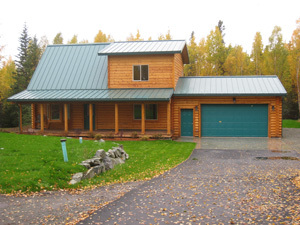 We provided the full weathered-in shell package for this owner builder. We have the 26′ X 40′ Aleutian 2 upper floors weathered-in shell package price available in both 8″ & 10″ Superior Logs. 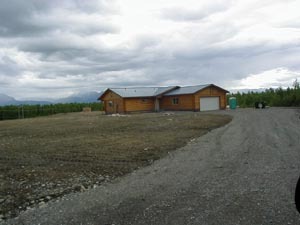 This custom designed home in our 8″ Superior Logs has terrific views of a Mat-Su Valley Lake (near Big lake) from the great room, loft & front wrap around decks. The covered entry has a timber truss & log posts supporting the roof. 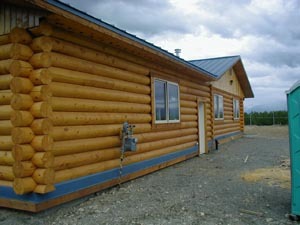 We provided the 8″ Superior Logs pre-cut package, log posts & worked with the builder for the owners. 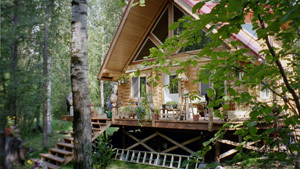 This cozy 24′ X 32′ cabin was built on Petersville Road near Norman Vaughn’s homestead. Our easy to assemble, pre-cut 8″ Superior Logs with hand hewn log purlins & ridge beam compliment any landscape. The 8″ Superior Logs pre-cut package assemble in a few hours with a 4-man crew. 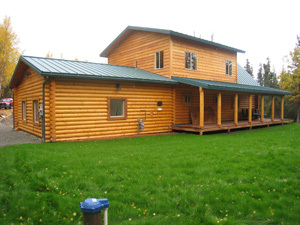 The 28′ X 40′ McCarthy plan in our 10″ Superior Logs was modified to sit over a basement for this Seward home owner. 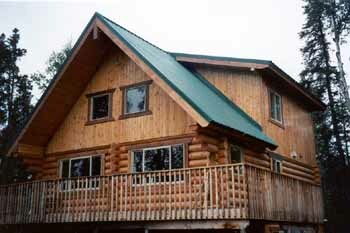 Our 10″ Superior Logs half log siding is on both gable dormers & gable ends. One side has saddle corners & the other post butting corners. The 10′ X 14′ formal dining/sunroom with bay window has an 8′ log arch entry. Wrap around decks with our log post supports offer a great seat for their mountain views. The 2 X 8 frame basement adds an additional 1,260 sq. ft. to the home. We provided the weathered-in shell package for the owner builder. We have the 28′ X 40′ McCarthy 2 upper floors weathered-in shell package price available in both 8″ & 10″ Superior Logs. This over 5,500 sq. 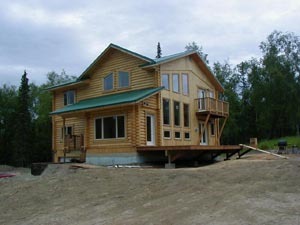 ft. custom designed home uses our 10″ Superior Logs. It has a full 2 X 8 frame & insulated block daylight basement with river rock exterior face, 2-car garage, recreation room, storage & poolroom. The main floor has a sunken great room, 12′ river rock fireplace with entertainment center, hardwood, slate & plank floors; log stairs plus an arctic entry with handmade plank doors & wrought iron hinges. The 3/4 loft has 2 X 6 T & G flooring over our 10″ log joist plus gable & shed dormers with exterior Stucco trim & cantilevered balconies. 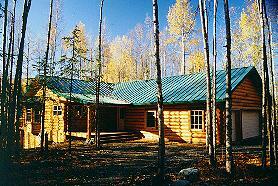 These Eagle River owners have spectacular mountain views in all directions. 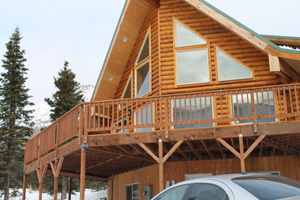 The 10″ Superior Logs purlins & 1 X 6 T & G #2 knotty pine are decorative not structural. This home has a conventional roof system using R-38 batt insulation & saved the owners many thousands of dollars in materials & labor. The basement & main floors have In-floor heat, which keeps this large home very warm along with the natural warmth of our pre-cut Superior Logs. This home was chinked due to the 100+ mile per hour direct winds common to the area. The standing rib Skyline roof puts the snow on the ground. 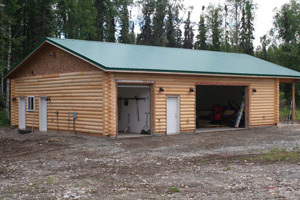 We provided the weathered-in shell package for the owner builders & worked with the builder.